Kimberly ‘Wendy’ Ponca (Osage) has been described as an Osage avant-garde, but also as an artist who continues the legacy of the traditional Osage figure Spider Woman, who, according to tribal stories, taught weaving to the people. She once stated, “Many people do art for money. Others do art for arts sake. I do art for history’s sake. 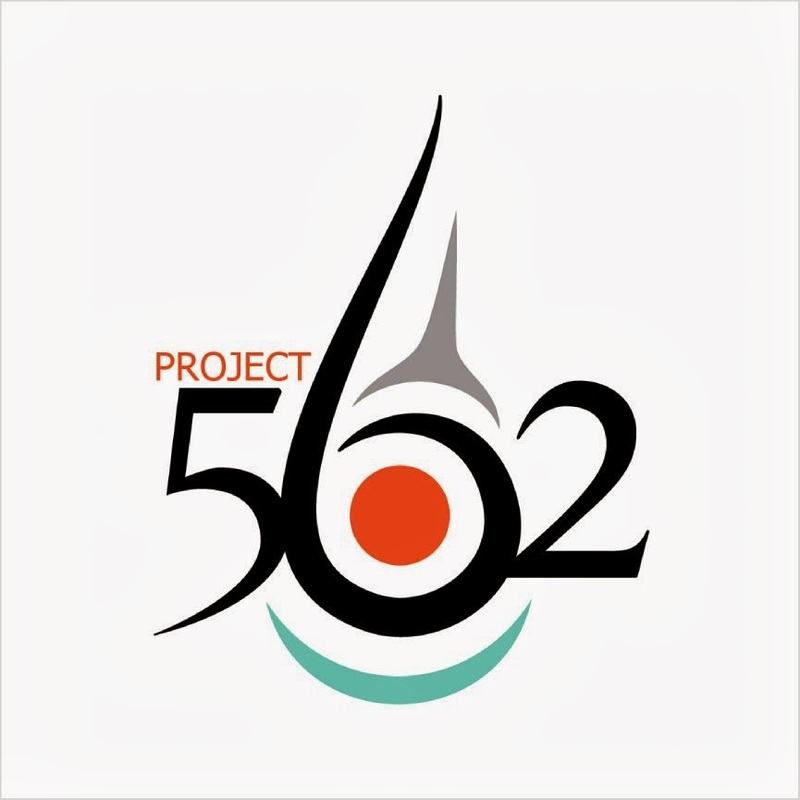 I want to preserve my traditional culture, while reflecting the signs of contemporary America.” Ponca maintained key elements of her Osage traditions by re-presenting them and expressing them through new materials, rendering them compatible with contemporary society. To create her wearable art, Ponca drew on her experiences as a contemporary Osage person, and this is evident in her juxtaposition of the time-honored with the entirely-new. Her garment collections have been described as both a reflection and a redefinition of a culture. 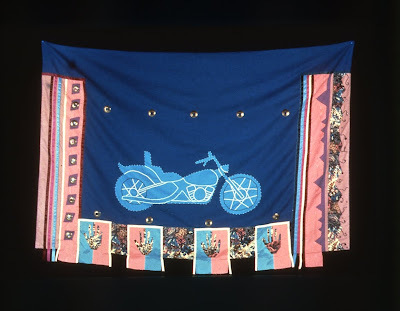 Ponca’s clothing and fashion shows deconstruct stereotypes, present theories of female beauty and power, impart Osage oral tradition and cosmological beliefs, and champion fashion as art. As a designer, Ponca used innovative new materials for her clothing designs to tell traditional Osage stories. For example, she incorporated Mylar, a synthetic material used on space shuttles, which she conceptualized as connected with the sky and stars. Ponca perceived these qualities as compatible with Osage cosmological beliefs. Traditional Osage stories communicate a deep connection that exists between the earth people and the sky world, since the Osage believe that their ancestors came from the sky. 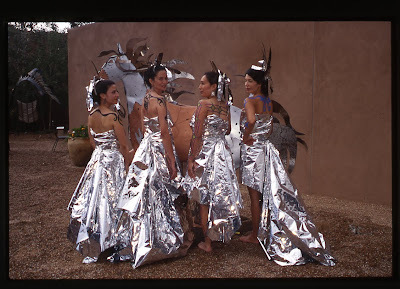 To Ponca, the use of Mylar accentuated the wearer’s relationship with the sky. Ponca also painted tattoos onto her female models’ bodies and adorned their hair with feathers for photographs and fashion shows. As Ponca explained, she used body paint and feathers because of the strength that it bestows the wearer. Ponca stated that the body art and feathers “changes you on the inside, your intellect, being. It’s a powerful thing, it changes you emotionally." This way of thinking directly related to her philosophy concerning garments and adornment: what you wear should convey identity, confidence and a tribally-informed sense of beauty. Other designers such as Pilar Agoyo and Virgil Ortiz have recently used similar body adornment in their shows and fashion shoots. Importantly, in the mid-1980s Ponca co-founded the Native Influx (later, Native Uprising) collective of designers, models, and artists, which was the first group of its kind – effectively establishing Santa Fe as the center for Native American haute couture. 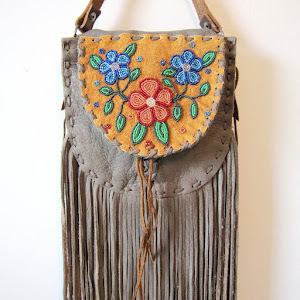 Furthermore, because of the innovations of this group, the Santa Fe Indian Market added new categories for judging clothing and paved the pathway to create a new market venue for Native clothing designers. 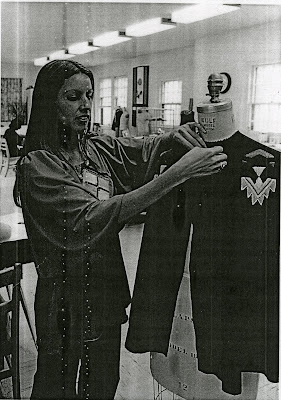 As IAIA’s main fashion instructor, Ponca undoubtedly greatly influenced her students’ work and the contemporary Native American fashion world. Wow, look at that KC-1Tank (fuel/cargo Cadillac)? I was just telling somebody that everybody is supposed to believe that classic cars are supposed to exist in Los Angeles because its part destiny and part linkage to the oldies music which is also supposed to be the cornerstone of their culture. The weather permited bold machines such as this one, to survive the rust and the salt of many other cities such as mine, Chicago. Got it, thanks for the weather report and the quick history lesson, I know, this is not why I am here but lets start over. Look at that sky, I can imagine the varieties of rock, and I"ll bet you can create some mean sun tea out there also. Yeah, I am skimming some art, and I read your message about what your purpose for creation of art is for you. I have seen many vendors selling something straight out of a native crafts catalogue as if they themselves went out to collect the raw materials. The motive, or motto must be that if they don't get this type of customer's money then somebody else will. Others have confessed that this is their way of getting even. There is one artist, from Mexico, who did all of the Mexican Indian art along with other paintings. His goal was that every home, no matter how poor, or humble, would have a piece of their history in their home, thus the art calendar was created. Some abash this artist for what he created on canvas, or because his art is not up to their satisfaction. Many auto body painters recreate a lot of these themes, as do t-shirt artists, or tattoo artists. Many of these person may have been exposed to this artists work in the form of a calendar as a child. Finally, someone else gave me an interesting video, made on a rez, and a woman talks about how many people talk as if they know everything about native culture. They do not realize that much of this knowledge was stolen, or prohibited by the boarding schools. Much of what is taken for granted was maintained in secret, and often times at the risk of physical punishment. I seldom write to others on the e-mail, but your heart just reached out and reminded me that doing what you believe to be right will always make your right, and you will never be wrong. 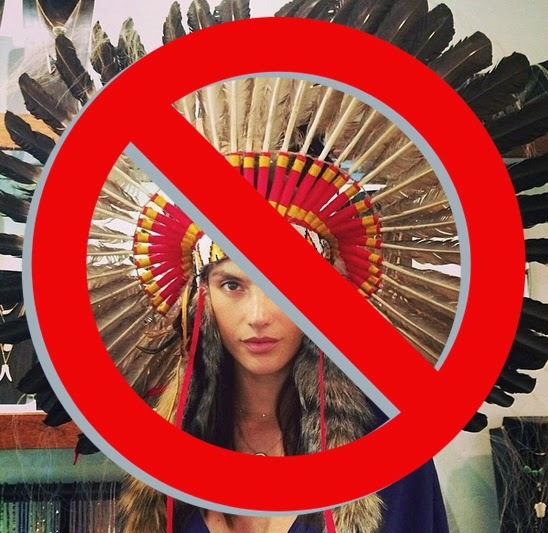 These stories, the truth, the culture, and the contributions from our ancestors are all important, because they maintain our identity and prevent other influences from polluting our circles at the risk of making us feel inferior about who we are. For a short while, as a youth, I was convinced by others that marijuana was a Mexican tradition, and that pipes were always smoked with this plant. Education proved these types wrong, and there is a wonderful glow from within each time I proclaim, "Proud to be drug and alcohol free", something which some "Young Sioux Ladies" taught me.